Riding a Brompton is an invitation to repetitively answer this one question, and to continually blow people’s minds. There’s a moment, when we’re rolling the folded Bromptons through a store or a restaurant, when it’ll click in the head of an onlooker that this funny contraption is actually a bicycle. The tilted head and squinty expression (that betray the confusion and desperate attempt to understand what they’re seeing) fade into a look of awe and amazement. I can honestly say that I love this moment. Of course, that mind-blowing moment isn’t always followed by a meaningful connection. Sometimes, we get to endure the inane comments and heckling of folks who’ve decided that we must be some sort of fantastic freaks for riding these circus contraptions. Or we have to hand over the bike to some random stranger who absolutely has to pick it up to see how much it weighs (hint: Bromptons are made of metal, just like most other bikes). And then there’s the automatic assumption that they’re Bike Fridays (which is a little maddening – not because we have anything against Bike Fridays, we just wish they hadn’t cornered the US folding bike market). These random frustrations aside, after a month of traveling on the Bromptons, we’re pretty much pleased as pie. And if you’ve been wondering if they’ve actually lived up to our hopes and expectations, read on. 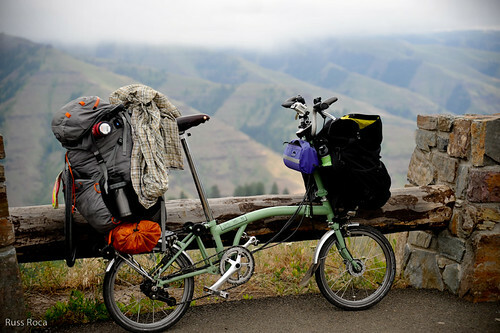 The first thing we can say about loaded touring on the Bromptons is that we are continually impressed with how well they handle the stress and strain that we heap on them. We are constantly asked about touring on the small wheels and if it makes life more difficult or sluggish – and we can honestly respond in the negative, because they’ve proved themselves to be much more rugged than we imagined. We’ve lost track of how many mountain passes we’ve climbed up and over. But we haven’t lost track of how many of those we were able to pedal every inch – all of them. We may only have six gears, but it turns out that they’re the right six. Sure, there are times when we wish that we had another gear in the in-between, but we knew about this limitation when we chose the Bromptons, so we’ve learned to work with what we have. The load capacity is, obviously, much less than our Surlys. In theory, we were thrilled by the need to lighten our load. In practice, we’re still thrilled that we can’t load them up any heavier – and, in fact, we’re continually wishing that we could cull our gear even further. Rigging the backpack to the back of the saddle has turned out to be a brilliant way to carry gear. Because of the small wheels, the weight of the backpack is low to the ground, keeping the center of gravity low. The backpacks hold a fair amount of stuff, in a streamlined fashion, without getting in the way of our pedal strokes or posture on the saddle. Which all adds up to us hardly noticing that there’s that much weight on the back (except when I load my backpack with food!). Plus, the ability to break everything down into just three pieces (bike, front bag, backpack) has been invaluable for the transit connections we’ve made. In all, we estimate that we’re each carrying about 50 pounds of gear on the bikes. Like I said, we wish that we could lighten this load a bit – but mainly because we’re just tired of schlepping around a world of stuff, not because we don’t think the Bromptons can handle it. That said, though, 50 pounds of gear is probably at the upper limit of what a Brompton can appropriately handle. One of the biggest downsides to riding the Bromptons is having to be more careful about road surfaces. They handle fine on smooth gravel or dirt (including most fire roads), but we have to be really cautious of bumps and a washboard surface. We have certainly pushed the Bromptons beyond what might seem prudent (including riding through a 4-mile stretch of highway yesterday that had been torn up to third world conditions), and they have performed admirably so far. But the small wheels don’t roll over obstacles as well as larger wheels do, so vigilance is key. The same goes for railroad crossings! Oh, and did we mention that it’s really hard to change a tire on a small wheel?! We both firmly believe that there is no such thing as a perfect bicycle, for touring or anything. What works for us may not work for someone else. After a month on the road, we feel like the Bromptons fit our style of touring really well – which is a slow, meandering style. We like the challenge of being minimalist, and we have no need to be super fast. We like to roll into a town and explore for a few days – and the folding nature of the Bromptons means that they translate beautifully into a city bike. As we look forward to, hopefully, heading overseas in the near future, we’re convinced that the Bromptons are about as perfect (for us) as we could hope to find. If you’re interested in the particular specs of our Bromptons, read this previous post. If you have any questions we haven’t answered, feel free to comment here or shoot us an email. Bravo on your Brompton Touring! It has been such a blast to follow your adventures. Absolutely brilliant use of the qualities that make the Brompton so versatile and more importantly, kudos to your values that embrace touring without hurrying. Dan Price said it…Chronicle life in front of you. Happy travels! So, will Panniers and Peanut Butter now need to be updated? Or perhaps there will be a Volume 2 on Bromptons. Either way, looking forward to more of your adventures! What makes your load ~50lbs each? Are you counting food and water (which changes daily) in that weight or is that just 50lbs of gear? Weight loads: Russ’ gear includes approx 25 pounds of computer and camera gear. Laura carries the food and, yes, her gear load does fluctuate. We haven’t weighed the final configuration of gear, so the 50 pounds is an educated guess. Gear Guide: Thanks for asking about an update to Panniers & Peanut Butter! We probably won’t update the original ebook to reflect our new set-up, since we feel the information is still really useful and valid as it is. But, we are talking about putting together some sort of how-to-tour-on-Bromptons guide. Surlys: They’re currently in storage, and we definitely foresee using them again in the future. They’re great bikes! Gearing: So far, we’re extremely happy with the -12% gearing option. Russ put a double chainring on his Brompton, but hasn’t used it yet, and will likely change it back in the near future. I love that you’re touring with Bromptons. Also very much enjoying the video format posts. Just out of interest, will you go back to spending some time on your Surly’s again in the future do you think? How are finding the different gearing setups you are using? 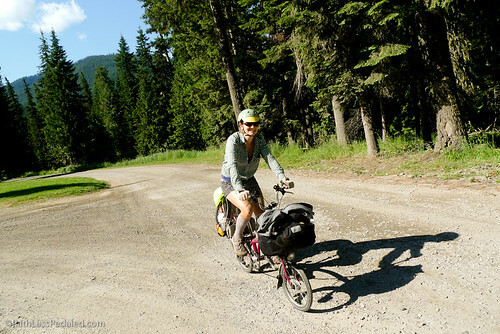 it’s really nice to read your touring stories, especially now that you are riding on Bromptons. A couple of weeks ago I’ve took my Brompton on a small tour (240km through the western part of the Netherlands) and absolutly loved it. There great litte bikes and can handle much more than most people expect. By the way, tire changing isn’t that hard, I’ve seen the video from Russ and when putting on the tire, you should try to finish near the valve, not start at it. And the marathons are pretty difficult to fit. The folding kojaks on my Brompton are on and off the rim in a matter of seconds. I wish you the best for the following parts of your journey. Why do you think it’s hard to change a tyre on a small wheel? It’s easier than a larger wheel simply because of it’s size. You only need tyre levers to remove the tyre. I never use levers to replace the tyre. Once you grasp the technique of fitting with just your hands you’ll wonder why and how you struggled before. That includes the fitting of Marathon Plus tyres also. Your traveling gives me the power of every day commute about 10 miles on my Dahon. But anyway … wish you great travelling and please keep us posted. Love your tales of travel on the Bromptons! Our Bromptons are on order (nearly 10 weeks’ wait so far!) and I look forward to your production of a touring guide that relates specifically to the Bromptons’ abilities. Enjoyed the 42mph video but hope it’s not the hub I can hear!! I am glad the Brommies are working out for you. I just did a nice southern Indiana tour with Elmer around the limestone country where ‘Breaking Away’ was filmed; he on his carbon-fiber road bike and yours truly on his Brompton. The B kept up fine on pavement and excelled on the dirt portions. As for tire changing I concur with Patrick about easy to change tires-try the Primo Comets 37 X 349 (measure a true 32mm wide). They practically dismount themselves! Well done on promoting touring on such a great bike. I have toured around Scotland (400 miles in a week) on a cheap Ridgeback and I am planning soon to tour Islay and Jura. I have an opportunity of purchasing a single speed Brompton for this trip. Do you consider it to be capable for it? Cool. Im gonna get a Giant Expressway folding bike to do some epic touring on. Was gonna get a full size bike, but I plan to do a lot of international travel, and well, it’s so much easier to transport. Encouraging to see so many others are doing tours on folding bikes these days. I like your idea of using a backpack strapped to the rack instead of panniers. Easier to breakdown your bike, and then you can just sling your backpack on and off you go. Thanks so much for your generous comments regarding Bike Friday products. Have you ever tried the World Tourist with the trailer?